A.M. Khalifa is a critically acclaimed author of international political thrillers and literary fiction. 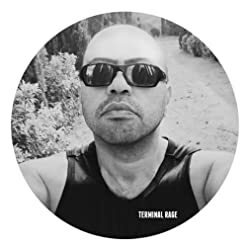 His debut novel, Terminal Rage, was described by Publishers Weekly as "dizzying, intricate, and entertaining," while Foreword magazine gave it a glowing five stars. Looking for a world-wind thrill ride? Follow A.M. Khalifa on his BookGorilla Author Page for his latest offerings. Please enter your email address and click the Follow button to follow A.M. Khalifa!